We have an app wherein we need to ask a number of data from the user. We have split this into multiple pages and we put a progress bar on top. However, because of the screen estate, we can only indicate the percentage of completion and not the actual steps involved. 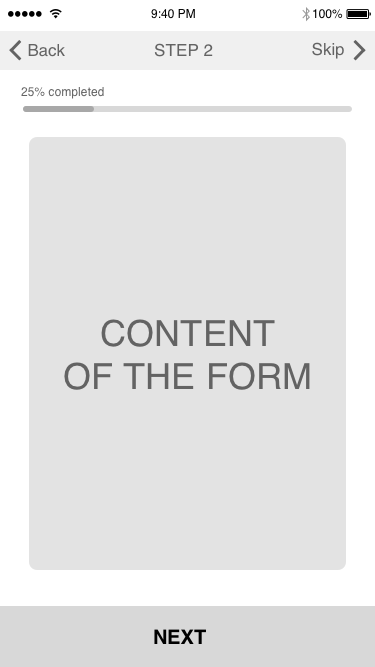 However, using this method, the users cannot go back to the other parts of the form in one click. They have to click "Back" all the way to go to the previous parts of the form. Presently your idea is great but if you want to show the number of screens in a minimal way then one way to do this is to segment it into different screens and provide the link at every checkpoint. By using this method it is easier to go back, skip and if the screens are at most 10 then it is easy to calculate too. Your design shows current progress but it doesn't indicate how many steps are left and any form of navigation. Something like this will solve your problem. While showing progress it also splits into a set number of steps. also the visual elements allows the user to be able to jump to previous steps but not steps that are ahead unless the present form is completed. Another possibility to indicate how much remains to be done is to use a count of the steps based on which field within the form has focus so rather than x% complete you could display Step n of m where m is the total number of fields and n is the index of the field that currently has focus plus the total number of the fields on the preceding pages. This would need to update on a get focus event. If the user goes back one page and selects a field in the middle of the page then it would correctly display which field they are on. Please make sure that the total number of fields is auto-calculated as nothing frustrates a user more than seeing that they are on field 203 of 200 or going from 10 of 10 to 11 of 11 then 12 of 12 - the page numbering in some editions of a certain word processor springs to mind here. Not the answer you're looking for? Browse other questions tagged forms user-behavior progress-bar or ask your own question. Are form progress bars when each section has multiple subsections a good idea?